Samsung Display announced its 55" mirror and transparent OLED displays back in June 2015, and later announced that it will start shipping those displays in Q2 2016. In May the company announced its first customer (a hair salon in Seoul) - but said that shipments to other customers will only begin in Q3 2016. TechRadar today claims that Samsung decided not to produce these transparent displays after all, because there was not enough demand to justify the investment. This is not confirmed yet, but it may be that Samsung could not make these displays at attractive enough prices due to low yields and high production costs. Samsung offered these transparent OLEDs to display system providers, and it will be painful news for those partners.. In February 2015, Planar Systems unveiled a 55" Full-HD transparent OLED prototype. Planar started accepting orders for the Planar LookThru displays in November 2015 for $14,995, and the displays should start shipping shortly. Eyevis also announced similar displays, and German-based Lang AG demonstrated a 55" transparent touch-enabled Full-HD OLED. 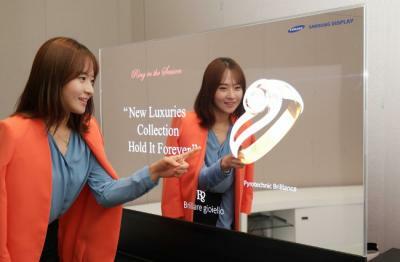 A couple of months ago Samsung also demonstrated smaller transparent and mirror OLEDs for the automotive market. These 7" are easier to produce compared to the large 55" panels, so hopefully Samsung will continue to develop those OLEDs, and eventually produce these commercially. 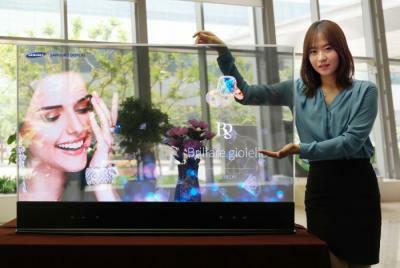 Following Samsung's entry to the transparent OLED market, LG Display also recently demonstrated 55" transparent OLED. It will be interesting to see whether LGD succeeds where Samsung failed (after all, Samsung also stopped making OLED TVs, while LG managed to scale up and produce OLED TV commercially). Transparent OLEDs are exciting, but will those applications actually create a large enough market? Check out our Transparent OLED market report to learn more!